Next up in our mini-blog-series looking at the state of the four proud provinces is the one we tend to harp on the most, ie Leinster. And we may not have any more rugby action this weekend but we have most certainly been in the news. Nobody with an ounce of decency ever wants to see someone lose their job. So if anyone suggests that there is dancing in the streets of Donnybrook right now at Matt O’Connor’s departure, they are either unaware of the facts or avoiding them. Still, there was a significant amount of fans who wanted him gone even before this troubled season began so throughout the season I have felt like I was walking a tightrope as letting him go either before or during this season seemed pointless, while at the same time I wasn’t happy with much of what was happening on the pitch for us. 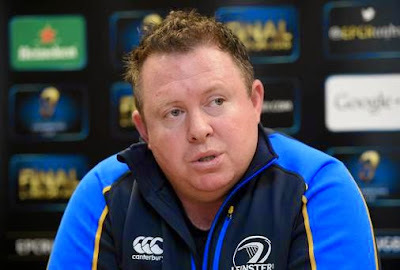 Doing writeups of every Leinster match as I do I tended to repeat myself as the season went on but here in one final post I will try to piece together exactly how I felt about the Matt O’Connor tenure. Where I disagree most with his detractors is over the 2013/14 campaign. While our style of rugby may not have been what we were used to, it cannot be denied that when it came to results, Matt’s first season at the RDS was better than Joe’s last and what’s more, the Aussie laid out his intention to fix our defensive structures at the start of the season and did exactly that, with our tries conceded numbers tumbling in the process. Not that everything was rosy in the Leinster garden during that campaign and far from it, but I still felt the Anti-O’Connor rhetoric was harsh during that time, particularly when it centred around two specific results in Europe, one at home the Northampton and one away to Toulon. Sure, we disappointed on those two occasions but what cannot be ignored is that those two clubs went on to win FOUR trophies between them that season. But then we came to the second season. You’ve fixed the defence and retained the league, Matt, well done. Now what? A senior-grade number 13 in his day, it seemed a logical step for him would be to evolve a style of attacking play for Leinster to go with the defence. As the weeks wore on, however, it became clear that this was simply never going to happen. Offloads became a thing of the past, there were was no endeavour to spread the play, we just seemed fixated on bringing the ball into contact wherever on the pitch, whatever the scoreline, whatever the stage of the game. The selections in key positions did not seem to make sense, not least at outhalf where I feel Ian Madigan’s overall development was hurt by the fact he was not in O’Connor’s plans. And much like last season, if it was a style that was bringing victories, even 3-0 ones, I’d more than likely be defending the system, but this wasn’t happening. In the early stages of the season we were losing to Connacht, drawing with Treviso and the worst of all, being put out of sight with relative ease by Munster at the Aviva. Such results put together with heavy weather made of a relatively easy European pool made the “anti-Matter” opinion swell from week to week and while I personally was still not totally giving up on him with a home quarterfinal to come, I could definitely appreciate the growing frustration. Then came the Six Nations. A period of the season Leinster fans have grown to rely on for putting right the wrongs from earlier in the season. And it wasn’t as though we were completely without our top players...included in our squad during that time were the likes of Fergus McFadden, Luke Fitzgerald, Rhys Ruddock, Gordon D’Arcy and Dave Kearney. Yet starting with the visit of the Dragons in February, the performances just went from bad to worse to even worse and the results went with them. I never stopped providing what I called “Matt-igating” circumstances; injuries to key players, the fact other teams played well, the responsibility of the players to perform, and my personal favourite, the fact that he was competing with not one but two Joe Schmidts; one the successful Leinster coach before him and one the successful Ireland coach now. But another thing we have to factor into all of this is his media profile. Of course it would be a shame if this was the be-all and end-all of everything, but it’s a reality of sport these days that you have to present yourself to the public when it counts and this wasn’t exactly his strongest suit. And publicly criticising the player welfare system certainly won’t have helped his cause. Then after much despair we had that performance in Marseille. The width of a rugby ball and one misjudged pass away from the Rugby Champions Cup final. Would I be writing this post now if we had scored a famous victory over Toulon that made the final? Who knows. But the fact remains we didn’t, and the failure to make the Pro12 playoffs that followed pretty much sealed his fate. And there’s another aspect to all of this - the imminent return of Johnny Sexton. While I would hold a certain level of respect for Matt O’Connor in the way he stuck to his beliefs on the way we should play the game, knowing how fervently Sexton sticks to HIS own beliefs which would be very different, I could not see the two seeing eye to eye. Maybe this wasn’t a factor in the decision for him to move on but in my opinion it is a good thing we never found out how they’d reach a compromise. This post has become a ramble but there’s a lot to discuss on this topic. To read some of the commentators in the mainstream media, we “online types” have been unfair to Matt throughout his tenure but having actually followed the general trend of opinion I think it’s fair to say he wasn’t a good fit to the province, whether or not the fault was entirely on his side of the equation. The bookies were quick to discuss a possible replacement, and the debate has been interesting to say the least. To believe the movement of the odds it seems Robbie Deans is among the top favourite, but I’m happy to let Leinster Rugby take all the time they need to make the right decision - there’s a decent amount of time between now and the start of preseason. Tomorrow lunchtime, Part 3 - Munster. I look ahead to their Pro12 semifinal against those pesky Ospreys.